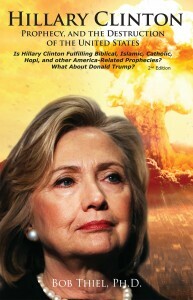 Last Thursday, I made arrangements with Amazon.com to give away, for five days, the Kindle version of the second edition of my book: Hillary Clinton, Prophecy, and the Destruction of the United States, 2nd edition: Is Hillary Clinton Fulfilling Biblical, Islamic, Catholic, Hopi, and other America-Related Prophecies? What About Donald Trump? Five days is the maximum time Amazon allows the offer to be free. Today is the fifth and last day! Anyway, the Kindle edition, Hillary Clinton, Prophecy, and the Destruction of the United States-Amazon 2nd Kindle edition, is free until some time today. And no, Kindle will NOT pay me any kind of royalty for those who get the book free. Since Amazon Kindle will NOT allow the book to be free for more than the five days, if you want it for free, you need to go to the link today before the free offer expires: Hillary Clinton, Prophecy, and the Destruction of the United States-Amazon 2nd Kindle edition. This entry was posted on Tuesday, June 14th, 2016 at 12:01 am	and is filed under COG News, Prophecy.